Consultative Cardiology - Dr. Hillemann and Dr. Kirwan are available for cardiology consultation 24 hours a day, seven days a week through their office phone at 802 862 6312. This includes consultations from physicians at hospitals, other than Fletcher Allen Medical Center, who may need advice regarding a patient or request transfer of a patient to the CVCA service at Fletcher Allen. If it is after office hours the answering service will contact the doctor on call for physician to physician consultations and referrals. Cardiac Catheterization - The process of passing a flexible tube or catheter into the heart through a vein or an artery to withdraw samples of blood, measure pressures within the heart chambers or vessels, and inject X-ray contrast materials to view the heart. Cardiac catheterization is used to evaluate congenital heart disease and ischemic heart disease. Coronary Angiography - An X-ray movie of the heart arteries that uses X-ray contrast dye. The X-ray is taken after inserting a catheter into an artery at the groin or wrist and guiding it to a coronary artery, where the contrast agent is injected. The contrast agent makes the artery—and any obstructions or abnormalities—visible on the X-ray image. A similar process can be used to obtain an image of the mitral and aortic valves and the functioning of the left side of the heart. A small ultrasound probe or imaging catheter is inserted into the coronary artery to measure the degree of blockage and assess more complicated coronary problems. A method to determine the significance of a blockage in the coronary artery. And to help decide which blockages need to be treated with a Stent and which can be treated medically. Coronary Stent—A slender metal mesh tube inserted into the blood vessel to prevent it from narrowing. When fatty deposits have built up on the interior walls of the heart arteries, the passages become narrow, blood flow is reduced, and angina pectoris results. Cardiologists perform angioplasty to widen these arteries and restore circulation. After the angioplasty, they may insert coronary stents. Percutaneous Transluminal Coronary Angioplasty (PTCA)— A procedure to open blocked arteries in the heart (or elsewhere in the body). A catheter is inserted into an artery in the leg or the arm and guided into the mouth of a coronary artery. A second, smaller catheter with a balloon at the tip is inserted inside the first one and guided to the obstruction, where the balloon is inflated and deflated to widen that part of the artery and restore blood circulation. Rotational Atherectomy (PTCRA)- In addition to dilating a blockage with a balloon and placing a stent, it is occasionally necessary to remove the plaque from inside the coronary artery. This procedure is referred to as atherectomy. It is usually done in conjunction with balloon angioplasty and coronary stenting. Sometimes it is necessary to place a filter in the coronary artery to protect against debris being released during the angioplasty procedure. This device is called a Filter Wire embolic protection device. 4) Insertion of intra-aortic balloon pump - Intraaortic Balloon Pump—A device used when a patient develops shock from a weak heart, usually after an acute heart attack. An intraaortic balloon pump can temporarily support patients and allow time for corrective heart surgery or other treatment. 5) Balloon Aortic Valvuloplasty ( BAV) - A technique in which a balloon is used to unblock a tightly blocked aortic valve to relieve symptoms in patients who cannot undergo surgery. Currently used mainly as a temporizing measure prior to proceeding to Trans Aortic Valve Replacement (TAVR) which is available at Fletcher Allen Health Care. An echocardiogram is a test that uses harmless sound waves to create a picture of your heart on a screen. The sound waves show the structure and movement of your heart. The pictures can show any irregularities that might be present in your heart chambers or valves and is a very useful tool for the cardiologist to evaluate a multitude of cardiac symptoms and conditions. The test takes place in our office, you will be asked to undress from the waist up and put on a gown. You will lie on the table on your left side, electrodes are placed on your chest to monitor your heart rate, the echocardiographer will place a tranducer on your chest and pictures of your heart are taken and recorded. Wear loose, comfortable clothing. You can eat and take your usual medications on the day of the test. Sometimes a regular stress test does not provide enough information about whether there might be a problem with the heart. In this situation an echocardiogram is performed before and after exercise which allows the cardiologist to determine if there is a blockage to blood flow in the heart or a valve problem that is present only after exercise. A specialized Echocardiogram utilized for special circumstances when the ultrasound images obtained through the chest wall do not provide enough information to answer the clinical question. The TEE is usually performed as an outpatient procedure at the hospital and requires mild sedation. It takes about 45 – 60 minutes and the patients usually go home after the procedure. Stress Test-Studying the heart during exercise to identify the presence of ischemic heart disease or the risk of developing problems while doing strenuous activities. The patient typically walks on a treadmill while connected to an electrocardiograph (ECG) machine. The ECG measures heart rhythms and can suggest when the heart muscle is not receiving adequate blood supply with exertion. To improve its accuracy, a stress test is often accompanied by an imaging technique (nuclear myocardial imaging or echocardiography). In some instances, especially for patients who cannot exercise or who have significant ECG abnormalities drugs may be used instead of exercise to simulate effects of exerciseon the heart. it can be used to evaluate the benefits of treatment over time. An electrocardiogram or EKG is a non-invasive, painless test that records the electrical activity of the heart. By analyzing this activity cardiologists can determine if a patient is experiencing a heart rhythm disturbance. An EKG exam requires the placement of conductive electrical leads on the patient's chest and limbs. These leads record the electrical impulses emitted by the heart. A computer converts the recorded information to wave forms that are displayed on a monitor and stored in a file that can be printed. The Holter Monitor, a portable device, takes a continuous ECG during a 24 hour period and provides physicians with information about a patient’s heart rhythm during a full day of normal activity to aid in detecting rhythm disturbances. The Holter Monitor consists of a recorder (a small device which is normally clipped to the patients belt or clothing) and electrodes that are applied to the patient's chest. Our devices also have controls that the patient can can use to annotate the recording when symptoms occur; a written log that the patient keeps accompanies the recorder for explanations of the annotation. At the end of the recording period, the recorder is removed, data is transferred to the computer, software evaluates the data and a report is produced for the physician to interpret. The event monitor allows for a longer monitoring period (up to 30 days)so that rhythm problems that might be missed during a 24 hour period may be detected. If symptoms occur the patient can trigger the device and transmit the information via the telephone to a live operator with 24/7 service. If significant heart rhythm abnormalities are seen the on call cardiologist is immediately notified. Co-payments are payable at the time of your visit. We will be happy to assist you in developing a payment plan. 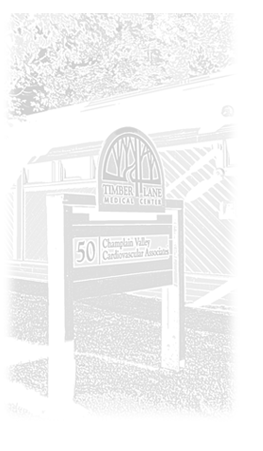 Dedicated to providing the most advanced, highest quality cardiac care for the people in Northern Vermont. E-mail: Send us an email.